We have reviewed, rated and compared Coleman air conditioners so you can buy with confidence. 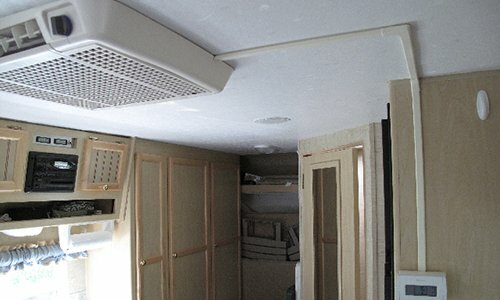 These AC’s are not for suitable for everyone so check to see if they fit your needs! Air conditioners perform differently for everyone. While one unit of the same line might survive for 20 years without breaking down even once, another might break down within 5 years of installation. An argument could be made that all this is highly dependent upon the installation techniques, but it is dependent upon the brand as well. Brands differ in terms of durability, warranty periods, SEER, purchase costs and so much more, and that is where customers often get confused. The initial costs of HVAC units are decreasing, thus increasing the number of options available to consumers. Coleman, more commonly known for its outdoor camping gear and equipment, also offers a number of air conditioning units to its customers, each with different qualities and price ranges and thus, appealing to a wider range of customers. Coleman air conditioners have a good standing in the market, but not good enough to be mentioned alone in the scale of market share. Coleman is the sister company of York air conditioners, both owned by Johnson Controls. While York focuses on high durability and extreme reliability, Coleman takes a relatively modest stance by featuring good reliability and durability, good customer support, and relatively higher SEER ratings, but at a higher cost. Here, we’re going to weigh the different features of Coleman’s AC systems and try to figure out whether they are the best fit for you or not. 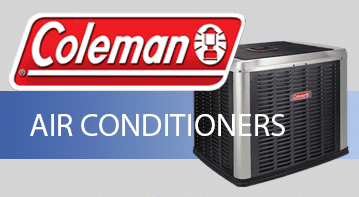 Coleman’s air conditioners offer a great return on investment to all, be it for residential use or commercial, thanks to their exceptionally durable chassis and compressors – the primary bone of contention when looking for a good air conditioner. You might find Coleman AC units to your liking in the summer no matter where you live, however, customers occasionally complain about their units leaking refrigerant gas during the winters in colder areas. This is primarily because when designing Coleman’s units, in an attempt to make the units sleeker and as small as possible, the coils were made smaller, leaving little room for the expanded gas. This might result in punctures in the coils and thus, leakage. However, this is a rarity, and Coleman’s helpful customer representatives find quick and easy solutions for all customers. The high SEER of Coleman ACs make it exceptionally easy for customers to afford an efficient AC without having to empty out their wallets. 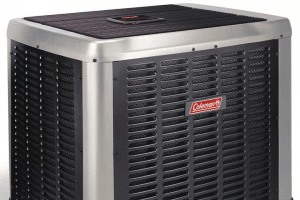 Coleman air conditioners are relatively costly in relation to the general competition, but when compared to the utility they give, their level of reliability, and high SEER, they more than make up for the high costs. Although average, Coleman also offers warranty for parts, compressors, and even labor along with its units. Customers have found Coleman’s customer representation extremely helpful in regards to giving a solution, but at the end of the day they, too, have been known to refer customers whose warranties have expired back to the contractor who installed the unit. While not the determining factor, these higher costs play a small role in why Coleman isn’t as big a name in the HVAC industry. The least expensive unit among Coleman’s air conditioners is the Coleman TCHD and Coleman TCHE, with a 13 SEER. This results in a lowered overall average of SEER 15.72. However, this average would have been even lower if Coleman didn’t have its premium unit, the Coleman Echelon AC21 boasting SEER 20. According to Coleman, the high cost of its units is due to the high durability and reliability they offer. Coleman AC units’ chassis has a powdered finish, allowing it to withstand diverse weather conditions. The compressor and condenser fan, are both enclosed in protective grills to safeguard them from the environment. We have compiled some information in the table below relating to the different models of Coleman’s air conditioners. Not only is Coleman directly related to York ACs, but also to LuxAire, another brand manufactured by Johnson Controls. While York and Coleman differ, as mentioned above, Coleman and LuxAire are extremely similar, even in terms of model numbers and cost! That said, Coleman offers a great deal more, especially the labor warranty, something that others simply can’t compete with. Coleman ACs, by themselves, are exceptional in almost every sense of the word, but as with any air conditioner, installation is key to keeping your unit in good health for years to come. One thing that makes Coleman air conditioners somewhat unreliable is their evaporator coil, as it tends to leak under intense use and extremely cold temperatures. Quality HVAC contractors have been known to identify this flaw and take steps to help the consumer out by recommending replacement of the coil, such as American Standard’s (internal link) coils. To make sure your Coleman air conditioner is in professional hands for installation, you should search for a contractor at modernize.com, a site with a number of contractors, each listed according to the level of trust customers associate with them and how close they are to your location. Modernize analyses all the listing applications it receives very carefully, making sure all the contractors meet the minimum requirements. Start searching by answering the questions below. The way Coleman air conditioners are named is complex, each name being the least indicative of the unit’s SEER rating or its functions. Here, we will explain what each model’s name represents. Before getting into the different Coleman air conditioners, it is important that we differentiate between the three series they are divided into. Echelon is Coleman’s premium series of air conditioners, featuring high SEER rating and exceptional build quality. This series is for those who want the best Coleman can offer, as these units feature a number of different features such as Charge View™, WhisperDrive™, Climate Connect™, and others. The Echelon series includes the Coleman Echelon AC21 and Coleman Echelon AC8B. The LX series includes the Coleman LX CC7, LX TW4, LX TC4, LX TF4, LX TC3, and LX TF3. These are the standard units Coleman has, each with average SEER and yet again, exceptional build quality and durability. The LX series isn’t as feature intensive as the units in Echelon, but they are still a force to reckon with. The most basic series Coleman can offer its customers is the TC Series, which includes only three units. Coleman TCJF, TCHD, and TCHE. These are for those who wish to save up on the purchase and installation costs. However, two of these three AC units might not be allowed for installation in some states due to their low SEER. Customers who bought the Coleman Echelon AC21, or any unit from the Echelon series, for that matter, are pleased with the product’s cooling, durability, and efficiency. However, all this is highly dependent on whether the unit is installed correctly or not. Coleman ACs have an average SEER of 15.72, while that of its most efficient unit is 20. This means that whether you are looking for a high-SEER unit or one that is cost-effective but low-SEER, Coleman has a unit that suits you. That said, there are other HVAC manufacturers as well that have an even better SEER, or more affordable units. But what is SEER? SEER or the Seasonal Energy Efficiency Ratio is basically a measure of how efficient your HVAC unit is in terms of energy consumption, i.e., BTUs consumed against kWh. Removing the S in SEER will give you a unit’s EER, a ratio that tells how efficient a unit is year-round. EER also takes into account how efficient an air conditioner is when cooling as well as heating. Unfortunately, Coleman air conditioners are somewhat lacking in that aspect in the sense that they are slow to heat up a home. Coleman has been fortunate enough to receive no complaints about its compressors, however, the same cannot be said about its evaporator coils. A compressor is responsible for putting pressure on the refrigerant Freon gas and traversing it throughout the coils. Coleman AC units perform that function exceptionally well. The only problem is that during the heating season, the hot refrigerant is prone to puncture the coils and cause leakages. As the name suggests, single stage compressors have one stage – full speed. This either means they are off or running at full speeds, cooling the room very quickly. This high speed and frequent turning on and off means more energy is consumed during operation, thus costing efficiency. Two-stage compressors have two distinct stages, full speed, and slow speed. Once the unit is turned on, these compressors run at full speed to cool down the room. Once the desired temperature is achieved, they slow down instead of turning off. This enables the unit to maintain the desired temperature, and save energy due to the slow operation. Variable speed compressors can make minute adjustments in their speed throughout the cooling process, running at full speed at the start and gradually slowing down as the require temperature gets nearer. This allows these compressors to save up on even more energy. However, two-stage and variable speed compressors are relatively slower to cool the room. Condenser fans are installed relative to the unit’s compressor types. Coleman Echelon AC21 has a variable condenser fan, Coleman Echelon AC8B has a two-stage fan, while all the other models have single stage fans installed in them. Coleman air conditioners’ compressors can act in reverse fashion to act as a makeshift heater during winters. However, they do not perform exceptionally well, as mentioned above, due to their slow heating and the danger of Freon gas leaking out. While slow heating is a general issue with Coleman air conditioners, it must be kept in mind not all customers face the leakage issue. Many Coleman AC customer reviews are positive in terms of coil durability. Coleman air conditioners are mediocre in terms of their noise performance. While the chassis of Coleman’s AC units are insulated with sound-absorbing materials, the sound still leaks through the bottom of the unit where a protective grill is placed instead of an insulating cover. Coleman’s quietest unit is the Coleman LX CC7 at 52 decibels during normal operation. This unit can go as low as 40 decibels under optimum conditions. This is adequate, especially when compared to competitors. Another aspect where Coleman ACs are just adequate is its warranty. It offers a standard warranty for its units, with ten-year compressor and parts limited warranty. Coleman aims to overcome this mediocrity with the help of its 90-day labor warranty, but it requires you to register your product after the purchase for that. Other HVAC manufacturers such as Lennox and Goodyear offer lifetime warranties on both, parts and compressors, giving them a competitive edge in the HVAC market. Coleman has several air conditioners with SEER 16 and above, making them eligible for a substantial tax rebate upon purchase. The US government allows a tax rebate of 10% of total cost (plus installation) up to a maximum of USD 300. This makes Coleman Echelon AC21, AC8B, AC6B, LX CC7, and TCJF eligible for said tax rebate. Coleman boasts a lot of good features that make it’s function a lot smoother and efficient. However, there are people who still tend to avoid these units. The major reason for that is the fact that despite being good at a number of things, there are competitors who excel in every single one of those factors – from low prices to high SEER. Following are some pros and cons associated with Coleman air conditioners. As can be seen from our analysis, Coleman is a good choice for a wide range of people. If installed properly, Coleman AC customer reviews agree on the fact that these units are durable, cost-effective and good cooling companions that require minimum maintenance or extra cost. Despite the American company’s specialization in outdoor equipment, it holds a good standing among customers for quality HVAC units as well. The Coleman Echelon AC21 is the pride of the company, boasting an overall good performance and reviews altogether, thus being its most sold unit. Although the brand has some unfavorable aspects, they are negligible due to the fact that only a handful of customers experience them. Many of these problems get rectified immediately due to the great customer support Coleman offers. In order to avoid any problems with your new Coleman air conditioner, you should look for trained and experienced contractors that know the ins and outs of installing or upgrading ACs. Finding such contractors may have been a cumbersome task in the past, but now, with the help of Modernize, trusted HVAC contractors are just a click away! get started by answering the questions below.